Earlier this month we enjoyed the Georgia National Fair and all of its splendor. Rides, exhibits, music, food, friends, fun–every bit of it. During one of our visits (yep, we went more than once this year–ALL the fun, y’all), we were wandering through the commercial exhibit hall. Cooter stopped to look at the piano in one of the booths. The truth is that Cooter found the hat at the GW Boutique, and he really liked it. His friend is a Clemson fan, so he cheers the team along with his friend. Am I a Clemson fan? Is the Fella? Is anyone else in our house? Not really. But it doesn’t keep us from loving Cooter in his Clemson fan-dom. He’s becoming his own person. He IS his own person. He is learning and living out his story, and he’s forming his own opinions about sports teams and what books are his favorites to read (biographies and history and oh, Captain Underpants) and what matters most to him. We’ve been studying the beginning of this country and how the government was formed, and so he’s even been venturing into forming his own political beliefs. On all of these things–sports teams, books, what matters most, and even political beliefs–there are things we have in common, things we believe the exact same about (Captain Underpants not being one of them, you understand), and there are things we absolutely disagree on. And yet, just this morning, that little imp told me I was his favorite Mama. And while, I’m the only nominee in this category–it’s not an award he had to give. So, despite our lack of commonality on several things (the need for him to do his science lesson being a major one), he loves me. And I adore him right back. Perhaps what I should have told the piano man back at the Fair is, that in this family, it’s okay to like and think and believe different things. That’s why it’s okay that my oldest loves music I don’t really care for, that my middle child loves UGA (though I’m a Tech Fan), and that my baby boy is a huge fan of all things football and enjoys books I am not really interested in. And it really is all okay. Because at the end of the day, we are all right here together. Living in our own little corner of this great big world. Growing and learning and sometimes changing our thoughts and beliefs and preferences as life takes us on down the road. And whatever it takes for us to live and love together, that’s what counts the most. Being okay with our differences and not only allowing but encouraging each other to have them–even if it’s cheering for a team I could care less about–that’s what keeps us going. That’s what matters most. In our house, our neighborhood, our town, our country, our world. For all of us. I hope you get to wear the hat you want. Because it’s your head, your journey, your story. And I hope folks love you just the same. My girl has big feet. That’s where the whole thing started today. We all need to have good walking shoes. Good ones. As in walking for miles. And no one really has shoes that will hold up under that kind of pressure and not leave our feet regretting it. So I loaded up Aub and the littles and we headed to the sports store to see what kind of shoes they had that might work. I refuse to buy top of the line for Cooter or our Princess because their feet are still growing. But good ones? Yes. Our Princess, who is destined to be very tall like my Fella, has big feet. For her age. She and I can wear the same shoes. Only she prefers a half-size bigger because her feet don’t like being cramped and in tight spaces. Flip flops are her best friends. The sad thing happened today when she realized she is no longer able to shop where they have the glitter and jewels and fancy colors on the shoes. She now has to choose from the same boring, plain, rarely lovely selection that the rest of us do. And she had her heart set on a pair of purple sparkly sandals. So she did what most nine-year olds would do. She pouted. She was tearful. She was a bit angry. She insisted that we go to another store. She despised the one really suitable, good pair I handed her to try on. They fit her feet but not her spirit. After much *ahem* discussion, she finally succumbed to pressure and said, okay. I told her if she wanted to we could put purple designs on the straps with t-shirt paint. I mean, I’m not a total ogre, right? She smiled wanly, and wiped her eyes. *sigh* The hardship of being big for her age. One of them anyway. 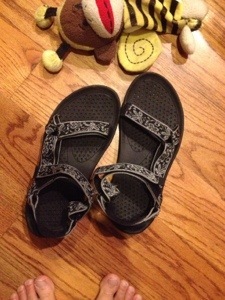 My girl’s new sandals, Miss Sophie’s sock monkey and my toes (which fit, along with the rest of my feet, in these shoes as well). But yeah, my girl’s new shoes. We plan to add purple or sparkles later. Meaning, sometimes you have to buy things “Made in China” because it’s hard to find anything suitable otherwise. I’ve tried to find shoes made in this country, but I haven’t been able to. I found a company that used to manufacture their shoes here, but they have since outsourced much of the production to China, so I was back where I started from. My children have heard me rant (I guess more than I realized) about this problem. I was so excited when I found socks made in the US at a local farm supply store. I have a hard time finding apple juice made in our country–are we not growing them anymore? I guess I’ve been pretty vocal, because when my sweet cousin knitted me a pair of socks, she wrote down where the yarn came from, how it was made, the environmental impact of the dyeing process, and so on. Love her for that. I think she gets it. And me. I’m not against these other countries making things. I’m not against us trading with them. But I am concerned about their employees being treated well and paid fairly for their work. And when I can buy a pair of jeans for $5, while on the surface looking like a great deal, I wonder how on earth they can pay someone adequately for the job well done. I don’t have all the facts, but I’ve read things written by folks who say they do. And it doesn’t look good. It’s been in recent months that I’ve wondered something though. While these reports and stories have me worried about buying “MIC” as I call it, I wonder if somewhere on the other side of the world, there is a young person trying to start on his or her own in the world or an elderly person still trying to make ends meet who is HOPING, with fingers and toes crossed, that we will keep buying. Because it’s a job. Because it might not be much of a living, but if we quit buying, they won’t have anything. At all. I’m not saying that’s how it is. I know my dollar is a vote in how things turn out in this world. The food and clothes and all products imaginable that I make a choice and spend money on–that’s my vote, whether intended or not, on how I think things should go. Maybe I’m rationalizing in my mind so that I won’t feel quite as guilty when I buy the Made in China shoes or the Made in Thailand sweater. Or maybe it’s dawning on me that there might be more to the story. Tonight I’m thankful for shoes that someone in China touched and made so that my child can have good shoes (albeit not fashionably acceptable to this nine-year old) for walking and taking care of her feet. My fingers are crossed and my hopes are spoken aloud that somewhere on the other side of the world, the person who did make them or who ran the machine that put them together, is doing okay. Leading an okay life. Better than okay I hope. Because bottom line, I don’t want someone else to have to suffer or be “less than” so my child can have a new pair of shoes. Or whatever. No one should have to suffer for me to “have” anything at all. Pondering this again. Won’t be the last time. A few mornings ago, I was laying in the bed on my side, and I was putting off getting up for as long as possible. I had been up late the night before, and I was fighting a headache, and I was tired. Okay, the reasons don’t matter, I’m just making up excuses. Suffice to say, I did not want to get up. I lay there with my arms folded in front of me. And I discovered something really funny. Funny strange. When I closed my right eye, my left eye, which was closest to the pillow, saw a huge obstacle (my arms) in front of me. When I closed my left, my right eye gave me a different view. I could see over the “obstacle” to what was beyond. Okay, so I’m easily entertained and I might have been looking for reasons to stay put (did I mention the house was cold that morning–the bed was not)–regardless, I spent the next few minutes closing one eye and then the other. The difference in the view was fascinating. I pretended being horrified by this huge insurmountable thing in front of me and then breathing a sign of relief when I could see beyond. And finally that was enough of that and I got up and began my day. I spent a lot of time that day thinking about the lesson in what I’d discovered. When we see things that we don’t think we can get through, get over, get around, go beyond, maybe all we need to do is take a step to the side and look at it from a different viewpoint. And yes, I realize it’s not always that easy. But I also know that sometimes I stay in one place, looking at a situation, letting fear and doubt take over, because I keep looking at it through the same lens, from the same perspective, same point of view. When perhaps if I talk it over with someone I trust or find a way to think about it differently or even let it go for the time being, maybe I will be able to see a way around/through/over what once seemed unconquerable. Chances are even good that there’s more than one way to get to the other side. That and sometimes maybe it pays to stay in bed a little longer. It can be good for the eyesight. The past few mornings, Miss Sophie has arisen a little earlier than usual. I don’t know how to figure it, but I keep blaming it on the time change. Why not? It’s an easy target and everyone else is doing it, right? As Miss Sophie sniffed the ground, I took a deep breath and thought about how different and yet beautiful this quiet morning was. And it occurred to me, all of these days, with all of their differences–in temperature and breezes and birdsong and sunlight or clouds–all of these were made by the same Creator. The same Artist painted the sun and brightness of yesterday and the day before as painted the gray and overcast of today. The same Hand waved the breeze gently yesterday as waved the whipping winds of today. Same Designer and yet different designs. No two days alike. Is it any wonder the magnificence of differences in each one of us? We have been designed and created by One who loves uniqueness and whimsy and color and light and all different shades and hues and sounds. By One who delights in each one of us. Just as we are. Today was so different from the past few. Tomorrow, bringing back a taste of the chill, will be even more different. But will any of us disregard a day in our life as unworthy or a total waste simply because it is different? Sounds ridiculous, doesn’t it? I can still get things done, I can still eat and work and do laundry and play with my children, you say, no matter the weather. I can go to work and the grocery store and send my cousin a birthday card, no matter what the day looks like. Oh sure, I might have to adjust my route or the timing of a thing or two if the day is very different, but a day that is a total waste simply because of the way it is? That’s crazy talk, Tara. And I say you are right. No day, no matter how different from our ideal–balmy, sunny, light breeze, birds singing, just a few beautiful fluffy clouds in the sky–is a waste. Even if it snowed tomorrow (ha! what year do I think it is? 1993?) it wouldn’t be a waste, would it? It might not go just as we had planned, but I expect most of us would come up with something that would make us feel downright all right about the day. A waste? That’s blasphemy! And so I think it’s the same with people. The Artist and Designer and Creator and Maestro who came up with the Idea of how special we were and are and can be made each one of us different in so many ways. It is really beautiful to think about. As much as I seem to enjoy talking to myself (ahem), I don’t think I would enjoy it very much if all I had to talk with or relate to or share thoughts with were more of me. And yet we have a bad habit of disregarding someone if they are different from us, don’t we? I have been known to do it. Oh well, she doesn’t see things the same way I do, so…..it would be a waste of my time to get to know her any more. Oh my, he is definitely making different choices than I would…..did you see what he was wearing? I’ll just move on, not worth getting to know him. We’d have nothing in common. I’m speaking in generalities, but the truth is we all have specific, very specific things that we use as reasons to disregard another person. Their faith, where they live, their income bracket, their schooling, their skin color, their gender, their sexuality, their health status, their job status, their style of speaking, their marital status, their hair color, the music they listen to, the clothes they wear…..shall I go on? It reminds me of our neighborhood drama. On a daily basis one of the children tells one or several of the others, “We’re not best friends anymore.” Because…..you won’t play what I want to play…..you won’t listen to what I’m saying…..you won’t let me go first…..you won’t come to my yard and leave her out…..you won’t share your doll with me…..you went home for lunch…..
and on and on it goes. Those seem pretty childish, I know, but the things described before theseconcerns and issues of the 5-10 year old bunch also seem pretty childish. If we never associated with anyone different from us, how sad would that be? I wouldn’t have very many friends. I wouldn’t have any friends. I don’t think that anyone I know and care about is exactly like me. And for that I am extremely grateful. Throwing away the chance to get to know someone, someone designed and created and orchestrated by the Great One just as he or she is simply because he or she is different, that’s as ridiculous as throwing away a day in our life just because the weather isn’t perfect. That’s just full of the foolishness, as my folks used to say. Make today a day to go and meet someone new. Someone different. Or maybe you already know someone but haven’t made time to say hello. I’m not saying you have to be BFF’s Forevuh or anything, but I bet you’ll be surprised if you really take time to listen to their stories. You just might find you have more in common than you do different. And maybe, just maybe, you’ll appreciate them for the work of Art they are. And vice versa. Go be fabulous. You were made to be exactly that. Today was another checkup day. This time for our eyes. I loaded up the littles and went to our appointment. I love that the office works with me. They saw all three of us at basically the same time. Very helpful. They did the measuring with the machine followed by the puff of air test for me. The tech told me they don’t do that one on children under twelve. I didn’t hear either of my littles complaining about that. We went back out to the waiting area to wait to be called by the optometrist. I took a few minutes to look at glasses’ frames on display. I wasn’t sure if my eyes have changed enough to warrant a new pair, but the frequency that I’ve been applying superglue to my current pair indicated that maybe it might be time to splurge. Bless her. She’s been to the eye doctor a few times before this. Great eyes. Perfect vision. And all she is hoping for is a flaw, a vision problem, so she can get glasses. So she can accessorize. She’s picked out “her pair” every time we’ve been there. I think someone is very excited about his birthday. His exam was quick and went very well. Now that he knows his letters, his exam was just like ours and he liked that. No glasses for him. He shrugged it off. He has bigger things to think about. But Princess looked over at me with a perplexing look. I could almost hear what she was thinking, that she sure hoped her brother’s good vision wasn’t contagious. She hopped up in the chair next. Her exam was identical. And then the words, “You get an A+. Your vision is perfect.” She held it together. I was proud of her. Oh, I’m just kidding. I knew it was coming. I’ve known it for a few years. When I first mentioned it way back when, the doctor at the time said I could probably hold off a little longer. The amount of time my glasses spend dangling off my face so I can read ingredients at the grocery store or look at what I’m crocheting or knitting or the way I have to slide them back and forth so I can focus on something up close–it has only increased in the past year. It all added up to one thing. So it goes. There’s worst things. Way worse. I’m ready. So much so that when picking out my new frames (I decided these won’t hold up to one more round of supergluing), I was in conversation about traditional bifocals versus the progressive lens, and I decided to go with the traditional. At least then I’ll know where to look. I like things to be clearcut and not so uncertain. But that’s a story for another night. I was trying on possibilities, and my Princess walked up. She sighed. “You’re so lucky Mama.” She walked away, so dejected it was pitiful. Bless her again. I remember that feeling. I don’t know when I first went to the eye doctor, but when I was in the fifth grade it was announced that I needed glasses. I won’t lie. The feeling of joy that welled up within me was huge. I was thrilled. 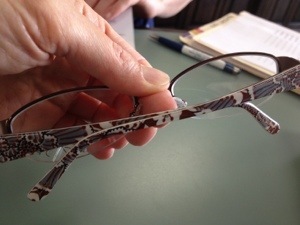 I had so hoped to get glasses–I had probably been crossing my fingers. Made my day. I was so happy that even though I knew that LP would probably call me “four eyes,” I didn’t even care. I had already “written” and played out in my mind my retaliatory response before the prescription was completely down on paper. Yeah, because that’s effective. And original. Yes, I was excited to have them, but that joy was nothing compared to what I felt when I put them on and looked around for the first time. I could SEE. I had no idea you were supposed to be able to read words on the billboards. Or that there were even words at all. The ride home in the bed of Daddy’s truck was such an awe-filled one. I remember being amazed at the clarity. I can understand my Princess’ desire to wear glasses, but I hope one day she will appreciate that she has really been given such a gift. Good vision. She didn’t get that from my side of the family. Mama was very near legally blind at 18, and it was only when her vision starting shifting like mine that she eventually reached the point she could go without glasses sometimes. (She did try contacts at one point, but after one of the four of us flushed her contacts when we were little, I think she just gave up and went back to glasses.) Daddy was far-sighted and needed glasses for reading. I suppose it is possible that my girl will need them one day in the distant future, but for now, I wish she could be thankful. I wonder how long it will take her to ask for a pair of the plain plastic-lens fake glasses. And I wonder how long I’ll be able to hold out. After all, I was nine once too. I know what that feels like. Thank goodness I don’t have to decide about all of that today. But today I did make several decisions. In a very short period of time. And I didn’t break down. Not once. I said yes to bifocals, yes to the line, and yes to a pair of new frames. Without consulting Aub, my oldest, who is quite helpful in matters such as these. My new glasses. The next time I see them they will have a horizontal line on each lens. Bring it. I think they are quite fun and whimsical and just right for entering this next phase of life. Life with a different way of seeing things. One where I can see things up close and near and dear to me, and the far away and uncertain things will be a little clearer as well. Bifocals can do all that? BRING IT. I’m ready. It’s time for a new way to see the world. I can’t wait to put them on when they are ready in a week. The ten-year old in me is giddy with excitement. And so is the forty-five year old. And that’s the best feeling of all.